My mother had a simple rule at Christmastime when I was young. We were allowed to open one present on Christmas Eve. We’ve all dealt with the desire to open a gift, even one simple gift, early on Christmas Eve. So she would let us. The catch was that she got to pick the gift. Without fail, it would be socks or underwear or some other piece of clothing. Even now, as I look back, I don’t remember the gifts that I got on most of those Christmases. I do smile as I remember the predictability of her answer every year as we asked the annual question, “Can I open a present early?” For me, that is a memory of the holidays. The idea that the holidays have given into consumerism by focusing on gift buying and receiving is one that we, as a nation, explore annually. It seems as though Christmas decorations appear earlier each year, and that advertising for holiday shopping begins a little earlier. While the “traditional” start of the holiday shopping season has been Black Friday, recent years have seen an increase of sales beginning on Thanksgiving night. That means, not only are stores open for Christmas shopping on Thanksgiving (and promoting it), people are shopping on the day(s) when we traditionally spent the time at home with our families. People question how to separate an increasingly consumerist spirit from the holidays. Some go as far as to suggest ceasing gift giving or giving gifts only to charity. Is this really the way to go? From a religious perspective, gift-giving activities associated with the Christmas season can be related back to the gifts of the Biblical magi given to the Christ child. From a non-religious perspective, we can consider that the mutual giving of gifts in Indo-European society (from which our cultures are descended) cemented relationships. For all who celebrate Christmas, whether religious or not, the holiday includes the celebration of family and relationships. Whether our holiday celebrations are religious or not, we can find a reason for gift giving — be it in emulation of the magi or to further the bonds of love and friendship that exist between us and those around us. If we continue to give gifts, how do we keep from sliding (or diving headfirst) into consumerism? 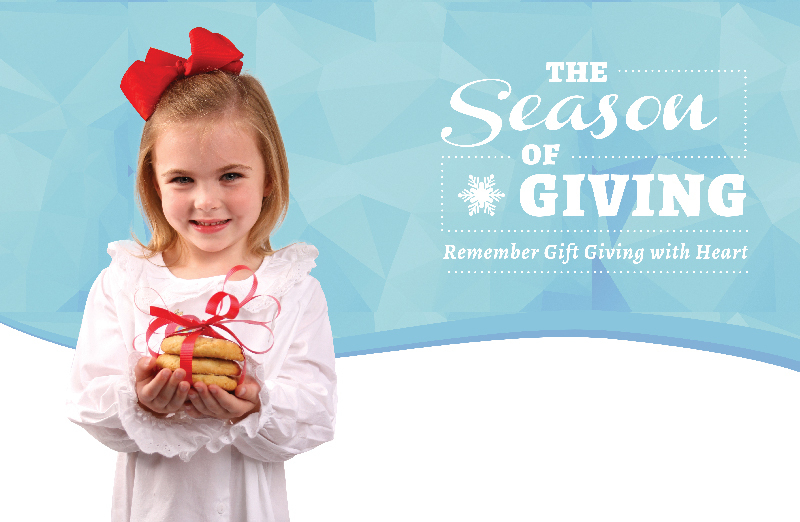 We can begin by reminding ourselves that even though gift giving is a component of the holidays, it is not the focus. Gift giving needs to be recognized as a token of love or friendship among those with whom we celebrate the holidays, and should not be judged based on cost or amount. When we begin to look forward to festivities with the thought of “What will I get for Christmas?”, we need to recognize that our focus is skewed. There is messaging all around us that makes it is easy to attribute the “magic” of Christmas to presents. When we accept this for ourselves, we willingly participate in a community absorbed in that message. It is when we make that choice that we get caught up in the spirit of consumerism. Consumerism is never a goal. It is a movement we get swept up in. And it is easy to do. The magic of gifts is in the giving, not the receiving. Changing that spirit doesn’t begin with our community, but with ourselves. Christmas is magical for kids. 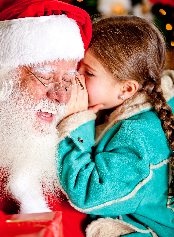 Undoubtedly, Santa Claus is one of the most magical aspects of Christmas for children. He embodies the holiday spirit of giving. 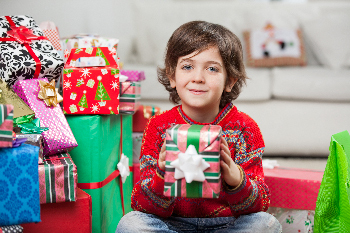 Though it is difficult for children at early ages to understand giving, receiving from Santa Claus imparts to them an understanding of the joy of what it is to receive a gift. This joy will later lead them to want to give so that they can help others experience that joy. When we ask our children, “What do you want for Christmas?” or have them create Christmas lists, we should also spend time educating them in the meaning of Christmas, and the meaning of gifts. Gift giving is wonderful when done in the right spirit. And it is the spirit of giving and thinking of others that matters, more than the actual gift. As parents, we share the world of hope and magic through our children’s eyes. There are Christmas lists, being good for Santa, Christmas cookies and milk, the anticipation of presents under the tree, and learning about the birth of Jesus. 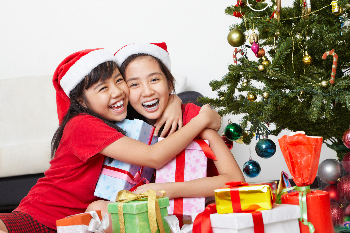 Children’s innocence, joy, and pure anticipation of Christmas wonder make parents’ hearts grow three sizes each day. Santa Claus is magical and is a part of Christmas. But the spirit of Christmas is something more. For Christians, Santa Claus should not distract us from the religious aspect of the holiday, but his giving can teach children about the gift of God given at Christmas. As adults, the rules change. “What do you want for Christmas?” seems like a sensible question. It provides some certainty that the gift we give is one that will be appreciated. At the same time, it does emphasize the “What will I get for Christmas?” aspect of consumerism. Using gift giving as a way to get to know people better and to celebrate your bond with them takes gift giving in a much more positive direction. As a nation, we should remind ourselves that even though gift giving is an appropriate part of the season, it is not the focus, and it should be done with the right intention. Also, as a reminder for the men, your wife may not be happy with you if you have to ask her what she wants. One way to naturally emphasize the non-consumer aspects in our holiday spirit is to schedule and participate in holiday events, both with family and friends, where gift giving is not part of the celebration. It increases the amount of time we have to celebrate the holidays with those who matter to us without the thought or pressure of gifts. Memories are the greatest gifts that we take from the holidays. The most cherished of them are built on the time that we spend with our families and friends in the merriment of the holiday season. Even as adults, we remember the excitement of “Santa came! Santa came!” but not necessarily what Santa brought. The deepest essence of the holiday is the experience of Christmas, its magic, and those with whom we share it. Holiday shopping with friends and loved ones, for friends and loved ones, is something to look forward to every year. Gifts, however, should not become the focal point; they should be only a part of the holiday package. We each have our own reasons for the season. If we are going to be focused on one consuming behavior, let it be the consuming of favorite holiday dishes in the wonderful company of friends and family.